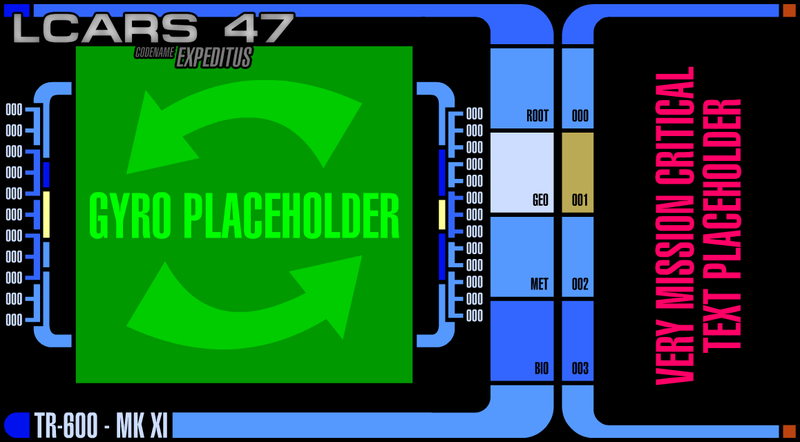 As you know, LCARS 47 for Android (Project Expeditus) is now in development (beyond the small Alpha test initiative). We're now running the line for a public production app. Wel, more accurately, two. The TR-600 and the PADD (although, the latter's name is subject to change). In this post, I'll be talking about the TR-600 (the name we've given to the Nemesis-era tricorder). Many users complained at the landscape layout, despite the intended operational orientation being portrait (who holds a tricorder on its side?). Anyways, the text labels need to stay landscape (since switching them would basically require a fundamental redesign of the UI). Having said that, however, the main anmation will respond to the hardware's gyroscope, thus flipping orientation. It's a compromise, but it's the best we can do. That's pretty much all I can say at this point, unfortunately, since this is all we have so far. We should have a release inside a month, so stay tuned.